Should be stored in the back of the fridge and not in the door as the door is the warmest place of your refrigerator. Store them in egg holders. For quick use, in about a couple of hours, storing in a butter bell on the kitchen counter would be a good idea. For long- term storage, put the butter in a zip-top plastic bag and store it in the freezer. As butter has the tendency to absorb certain smells, wrap it so that it does not absorb other odors. Some people prefer to keep it unrefrigerated, which is not good, as it makes the yogurt sourer and spoils the taste and texture of it. It is best to freeze cheese wrapped in a wax paper to retain its freshness. Keep air out of it and keep it cold. Bread for daily use can be kept on the kitchen counter but if it is to be stored for a longer time, then put your bread in the freezer and not in the fridge. If you live in a humid climate, then leave that bag open a little bit to prevent moisture build-up. Homemade bread can be sliced and put in a plastic bag in the freezer and use it whenever needed. 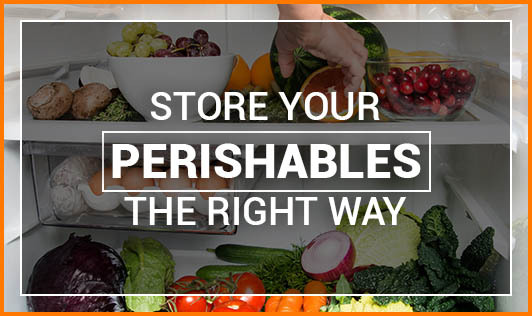 Proper food storage helps to preserve the nutritional value and quality of the foods you purchase, and also helps make the most of your food by preventing spoilage and food borne illnesses caused by harmful bacteria.